With three-quarters of a century now separating us from the last gasps of Rochester’s interurbans, it is not surprising that we might collectively recall these now-extinct beasts only from their last years. A weatherbeaten interurban car with faded paint mirroring its fallen glory, grinding out its last few miles with but a handful of faithful passengers, is all we are likely to imagine now. Behold, then, our photo for this latest installment of this column. The world is young again, and the mighty interurban has only just pierced the boredom and separation that marked farm life at the beginning of the twentieth century. Westbound car 116 of the Rochester, Syracuse and Eastern Railroad is seen thundering through the rural lands of Perinton, and is about to cross Hogan Road. 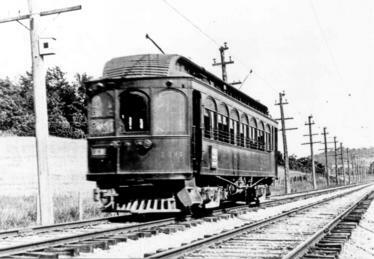 In short order, this car will pass through Fairport, East Rochester, old Brighton village and, finally, University Avenue on its way into Rochester. Unlike most photos of this era, we know the date of the photo and the name of the photographer. RS&E Superintendent Paul E. Emerson had taken a 116-size camera with him on an inspection trip to Newark, New York. The company’s car house there had just suffered a fire, and a temporary wooden structure had been built as a replacement. His photo of the temporary car house is the only known photo of this building. Emerson snapped another photo there showing a wood frame storehouse with a calendar for July, 1912, and proceeded west. He was interested in the westbound signals just erected between Macedon and Fairport. These signals were needed on the double-track RS&E to prevent rear-end collisions during busy times. After making three photos of signal 14 at Egypt, Emerson seems to have walked to the next nearest flag stop, at Hogan Road. While waiting at Hogan Road, Emerson must have decided to make a photo of the next passing car. A slight blur in the “LOCAL” sign tells us the car was indeed in motion. That the entire car is not blurred leads one to imagine Emerson making his photo of a slowing car, and then madly waving his arms to signal the motorman to stop the car so he could board. That this series of negatives does not contain any scenes farther west suggests that Emerson did manage to stop 116 for his ride back to the city. Emerson’s photo of 116, an afterthought perhaps, nevertheless remains a fine image of a bygone era. It captures a moment in time not likely to be repeated in our area…except at the New York Museum of Transportation.